When you plan a family trip in your RV, one important key is to know the RV kitchen. Know the equipment you have and what other gadgets can function inside. Most likely you won’t have the cooking gear to serve a fine feast for the family. Learn how to maximize your RV’s kitchen so you can save time and money and make your family’s trip more of an enjoyable experience. Determine how much cooking you will do. If your family will camp in an area without any services, consider purchasing reusable cooking items such as pots and pans. Purchase also reusable plates and cups in order to save money. Add supplies for fun activities such as marshmallows and chocolates. Ensure you have enough food items for the number of days you will travel. Create a menu plan. 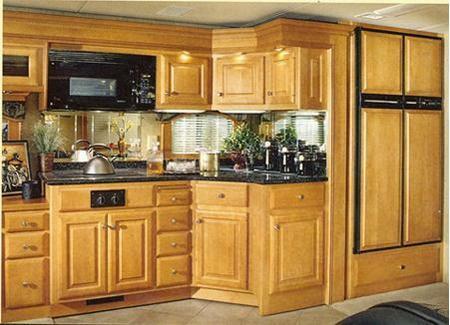 Since most RV kitchens are small, you should pack only what’s necessary. Draft a menu for every meal you plan to cook during the trip. Consider having members of the family involved in making the menu. Purchase all necessary ingredients and properly store them to avoid quick spoilage. Consider purchasing items that lasts longer or are non-perishable. Pack some coffee, hot chocolate, oatmeal and even junk food. Determine the utensils and kitchenware you will need. The RV kitchen’s space is limited, so you need to learn how to maximize it. Choose double-duty cookware instead of just single-use items. Purchase a cast iron skillet, which you can use for searing, frying and baking. Purchase small wares such as peelers for fruits and vegetables. Turn your refrigerator on at least six hours before travelling. Ensure that it’s ready when you start storing your frozen goods and other items you must keep refrigerated. Make sure you know how to operate your RV’s refrigerator properly. Use clear reclosable bags to maximize space inside the freezer. Ensure you label the item on each bag before storage. Purchase a few tablecloths. You can purchase disposable paper tablecloths at the supermarket to ensure you keep your RV kitchen clean. Stock up on towels and other cleaning supplies as well. Ensure you have cleaning items to keep the kitchen properly clean and safe for your family’s health. Since you will be travelling, have a garbage bags on hand for proper disposal of your garbage. Separate dry from wet waste to avoid spillage. Purchase garbage bags from your local market. Store your items carefully. You should keep heavy items such as jars and cans in low storage areas to prevent their sliding out during travel. When storing items in cabinets, save space by placing your light items on top of the heavy ones. Ensure your lock cabinet doors properly. How to Bake a Chicken ?